Easter, if you are a believer, is actually a bigger deal than Christmas. Christmas marks when Jesus arrived on Earth, and that is something worth celebrating. Now that I have babies, I marvel at the idea that the holy God of all the universe would be willing to spend time being a baby, growing up in a world where children are so dependent on others, where he could be physically and emotionally hurt, where he would have to contain his Godness inside a feeble body that starts out unable to even hold itself and move around, and would eventually…die. Because Easter is about the real purpose of Jesus coming. Easter celebrates how Jesus defeated death! My 4-year-old gets so excited about this concept. She tells me regularly that God can’t die, but when Jesus died, he came back to life. BACK. TO. LIFE. Seriously. Isn’t that exciting!? So why have I never worked to make Easter exciting for my family? It’s lovely to have an egg hunt, and we will continue doing that. 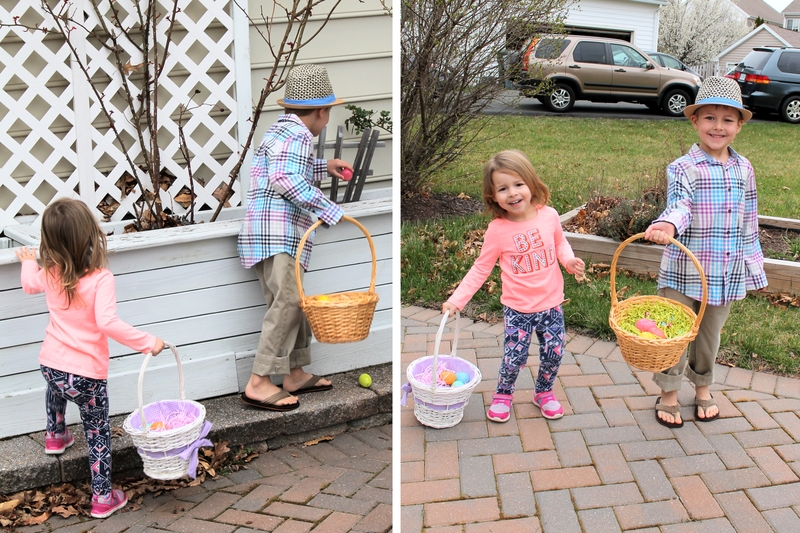 But I want my kids to feel joy and anticipation leading up to Easter, not just have it suddenly happen upon them as they trudge outside of a Sunday morning to find some candy hidden inside plastic eggs. This year, I am diving into Easter the same way I usually dive into Christmas. It’s not going to be perfect: finding my way into creating new traditions is a layering process. I will try some things this year, and tweak them or add more next year. 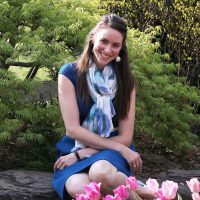 If you are interested in Lent specifically, I recommend the Don’t Mom Alone podcast episode in which Erin Moon discusses liturgical Lenten traditions. I love the idea of diving into liturgical traditions during this sacred time of year, and celebrating the life of Christ the way generations of believers have before me. I am even planning to get a copy of the Book of Common Prayer, although I do not belong to a liturgical church, because I would like to understand more about the history of Lenten tradition. But, as I said, this year is dedicated to Holy Week and finding a way to set this week apart and make it something noticeable and meaningful in my family. I made a schedule of activities to do during each day of Holy Week. Some of these include special foods. 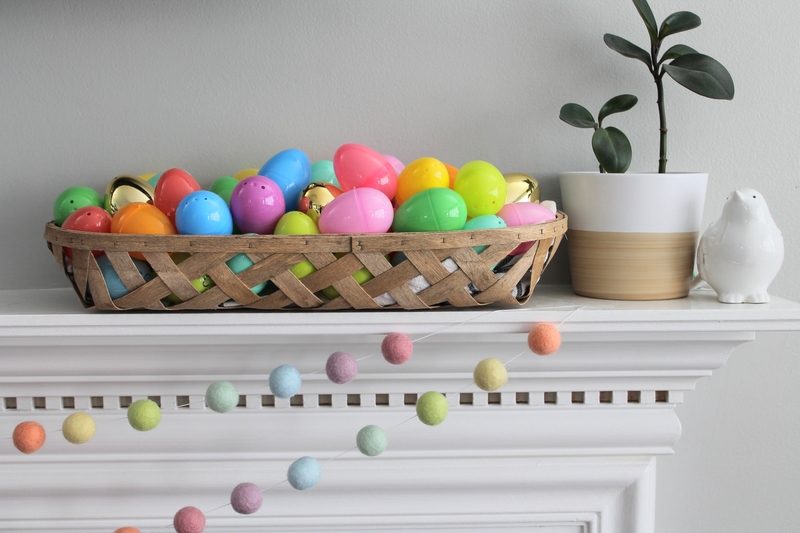 In addition, I came up with a long list of Easter-related songs I plan to play in our house during this week to honor Jesus and help my kids get a sense of why we celebrate. 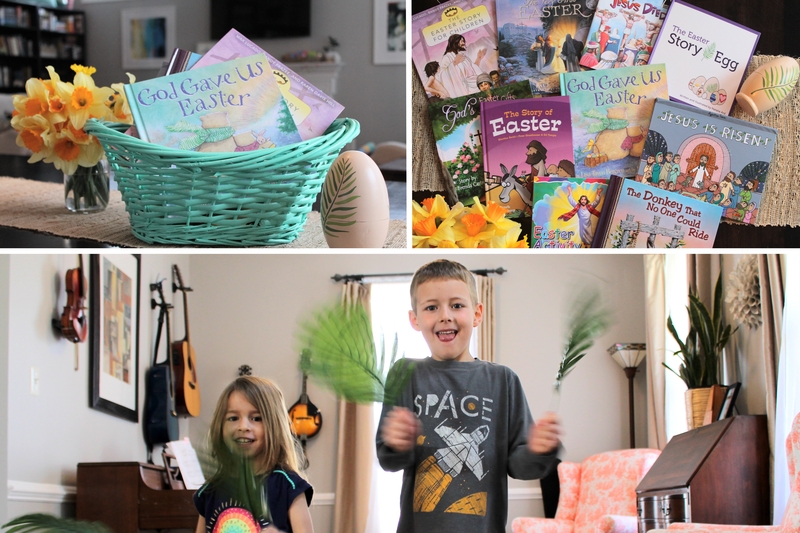 Palm Sunday is the day I plan to get out our Easter book basket, which is full of beautifully illustrated versions of the Easter story, and even a few activity books. I thought about getting it out earlier, during Lent, but then I realized that sometimes books and activities start to feel stale if you do them over and over. Instead of letting the Easter books get stale or boring, I will only have them out for one week before Easter, which will also help my children sense that this week is special! After church on Palm Sunday, we will come home and have a Hosanna! dance party. I purchased a bulk pack of fake palm leaves for my kids to wave around and play with. Maybe we will do a processional, where we put them down on the ground and walk over them. 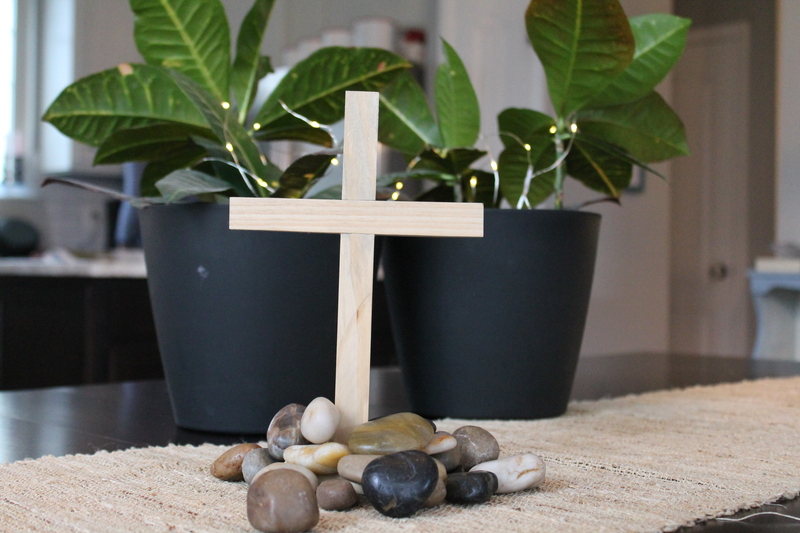 I will have the kids fold together crosses out of green construction paper (in churches that bring in real palm branches, kids often make crosses out of the fronds). We will also make pax cakes, which is an old British tradition designed to entice villagers to come to church! We are going to make a shortbread version and stamp them with little lambs, and we hope to hand them out to our neighbors along with our construction paper palm crosses, written with a message: Peace be with you. Last year I got two 100-piece jigsaw puzzles printed (check out Zazzle.com if you want to do this! You can upload your own design and get a 100-piece puzzle for around $15). 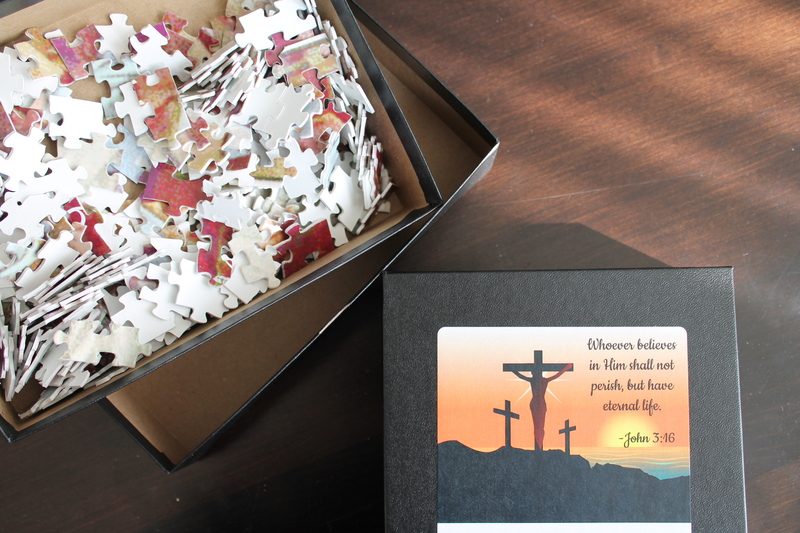 Our puzzles are printed with stock Easter images to which I added Bible verses—John 3:16 and Matthew 28:6. We will take some time this day to put them together as a family. They can stay out the rest of the week. This will be a craft-oriented day. We will make some kind of cross art, like these stained glass crosses, or perhaps the Jesus covers our sins confession activity. 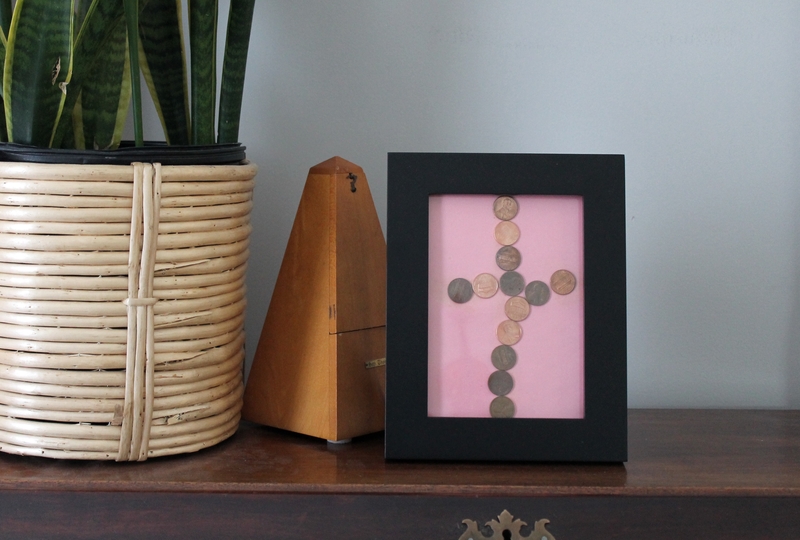 Another really simple idea (which we have obviously already tried) is making “Jesus Paid It All” crosses out with coins and construction paper. We will place white daisies into red water today, and throughout the week, the daisies will begin to become stained with the red dye. This will be our day to dye Easter Eggs! We will go wild and worry too much about tying this to a religious theme. I am not planning to spend time talking about how eggs symbolize life or anything like that. But I did want to try drawing designs in white crayon on some of the eggs before we dye them, which could have a connection to Jesus cleansing us of our sins. I’m not going to hit that too hard, because I do not want my kids to feel like I’m beating them over the head with symbolism during Holy Week—some traditions can just be for the sake of fun. I’ve read that the Wednesday before Passover is traditionally a day of cleaning for Jews. Since Jesus died at Passover time, we will also embrace a little bit of Passover tradition by cleaning the leaven out of our house. In this way, we connect to the fact that Jesus was Jewish, and he would have been celebrating the Passover when he was arrested. Yes, that means all the bread (and cereal? I’m still researching/considering this) will be leaving our house. Don’t worry, it’s only for a day! This day represents the day Jesus and his disciples ate the Last Supper, he prayed at the Garden of Gethsemane, and he was arrested. To honor this day, we will have our own little last supper at home. I have been doing a lot of reading about the Passover, which may have been the meal Jesus was sharing with his disciples before he was arrested, and trying to come up with a version of this meal that recognizes the history of the Jews fleeing Egypt, but combines it with the true event we are celebrating as Christians today, which is Jesus’ sacrifice on the cross. I admit I’m still working on my plan, but here are the broad strokes: we will start our meal with a foot washing and end with communion. We will eat lamb (well…I won’t, but everyone else will), to mark the fact that Jesus took the place of the sacrificial Passover lamb. We will likely eat a kosher meal, meaning that because we are having meat at our meal, we will not have any dairy, and we will also not eat any unclean foods. 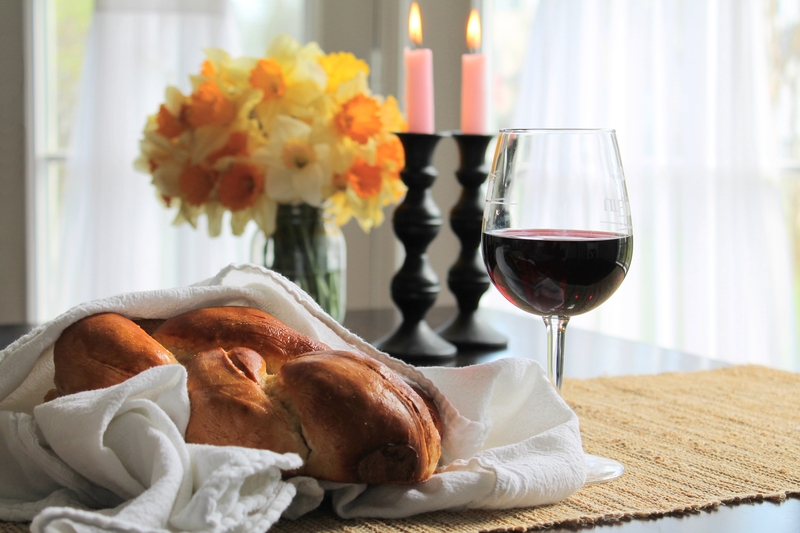 And we will do some of the traditional elements of a Passover Seder, such as removing chametz (leaven) from the house and telling the story of the exodus. I must admit that I am probably most excited about this day of all the days of Holy Week leading up to Easter. On Good Friday, most of our activity will happen in the morning. For breakfast, we will eat hot cross buns, spiced to remind us of the burial spices that would have been used to prepare Jesus’ body. After breakfast, we will be making our own Ebenezer around a small wooden cross. As a family, we will take turns placing rocks at the foot of the cross and speaking aloud the things we have seen God do over the last year. Each rock will represent one thing God has taught us or given us or even taken away from us. My hope is that we will end up with a great pile of faithful deeds, a visual reminder that God is good and that he is active in our lives. Our Ebenezer will stay in place until Easter Sunday. This year, Good Friday just so happens to fall exactly on my daughter’s birthday, so my challenge is to find a way to honor both a birthday and a death day. I want my children to understand that Good Friday is a day in which we mourn because Jesus DIED, but also I need my daughter to feel celebrated for herself, and not completely like an afterthought in the middle of my quest for Holy Week to be meaningful. So, we are not going to go to a Good Friday evening service. Instead, we will have a special birthday dinner for my 4-year-old big girl, and then we will have a little mini Tenebrae at home, in which we read the last words of Jesus and extinguish candles (candles! We blow out candles for birthdays, too, right? ), until we sit in darkness. I think the Tenebrae idea is a great way to visually represent how dark the world would be without God in it. 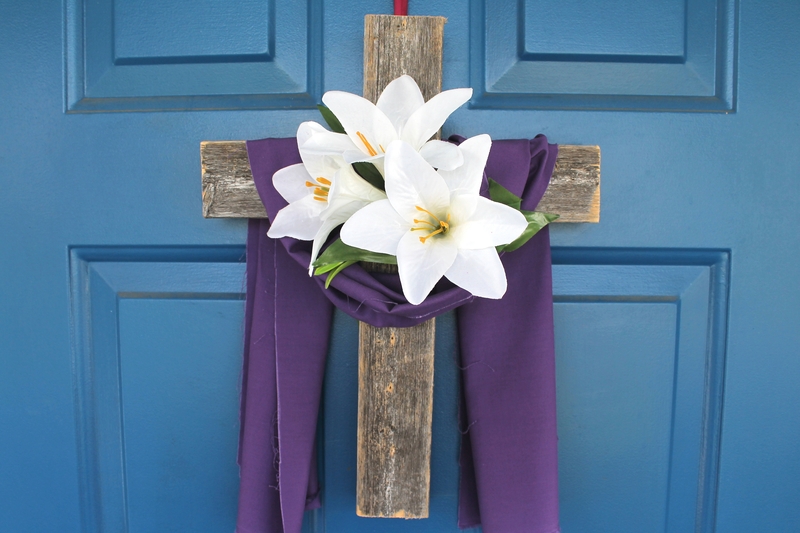 I do want to find a way to work mourning into Holy Week with my kids, because Jesus’ death is a huge part of Easter! It’s not all bright colors and dancing. He really died. The Earth really did have a WHOLE DAY in which it seemed like all was lost, that God was gone, and that there was no hope. I want to remember that Jesus’ death, although it led to something more wonderful that I can fully understand, was a time of incredible sadness. I want my children to experience both sides of this event, so that they can feel the joy of Easter morning more fully! We live close enough to Washington, DC to take a day trip. On this day, we plan to go visit the National Gallery of Art and check out some artist depictions of Jesus. And, of course, then we can run around the National Mall and ride on the carousel. This morning, we will do a lot of the fun, silly things many of us grew up doing. I am filling Easter baskets for my kids—in our house this means a lot of chocolate candy and one small gift. Before church (we aren’t coordinated enough to make it to a sunrise service) we will have an Easter egg hunt in the back yard. On Easter, as on Christmas, I let my kids eat about as much chocolate as they can. I have wondered and wondered what really makes a holiday feel special to me, and often the answer is indulging in food I love. For my kids, it’s certainly chocolate. Because I want them to feel joy on this day, and to notice that this day is special and different from all the others, I let them eat chocolate until they are content. My daughter is still talking to me about how much candy she got to eat on Christmas day, so I do think the freedom to dive fully in to something they love, be it candy or games or something else, helps them mark the day as a true celebration. After church, we will have a special, fancy meal in the middle of the day. In the past, I have invited over all of my husband’s family to join us, but this year, I don’t think I have it in me to organize such a big event (up to 22 people! ), so it may just be us. Also, let’s not forget those red-dyed daisies (from Tuesday). This morning, I will trade them for white daisies, because Jesus washed the stain of sin away when he defeated death. We will read the story of the resurrection from John 20, and hopefully talk about it with the kiddos. We will also listen to Easter hymns and praise songs! I hope this list of activities inspires you to celebrate Holy Week with your own family. Take one or two ideas and help Easter become a holiday of significance, not just because it is Spring or because we like chocolate (which we do), but because Jesus saved our souls by rising from the grave!